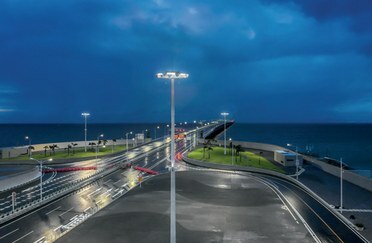 Champion LED Pro and GTLED luminaires from Thorn have been chosen to light the brand-new Hong Kong-Zhuhai-Macao Bridge. Thorn has provided much of the lighting for the brand-new Hong Kong-Zhuhai-Macao Bridge – the world’s longest sea bridge – which is due to open soon. The teams in China and Hong Kong secured two of the three lighting contracts associated with the 115.9 billion yuan (€14.7 billion) project, using luminaires from Thorn. Thorn’s products illuminate the two artificial islands at the east and west of the crossing, and the tunnel that leads to the bridge from Hong Kong. Thorn was one of just three suppliers in the final round of bidding to light the artificial islands, and eventually won thanks to its ability to meet the extremely high construction standards and rigorous technical criteria. Thorn provided 120 Champion Pro LED 132 high-power floodlights, mounted on 12 high masts. 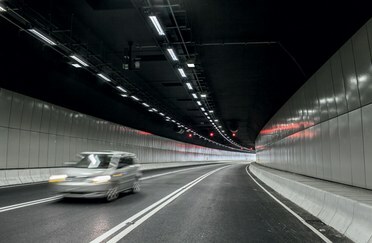 The company also supplied 6000 of Thorn’s GTLED Entry and GT58 luminaires with DALI drivers to light a one-kilometre tunnel. These dedicated tunnel luminaires provide excellent lighting performance with high uniformity and long life. The 30km bridge will dramatically reduce driving time from Hong Kong to Zhuhai and Macau from 4½ hours to just 40 minutes.